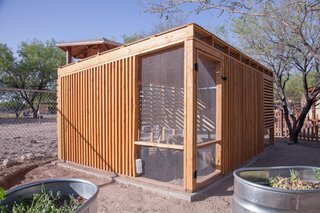 Designed for his son’s school in Tucson, Arizona, architect Gideon Danilowitz builds a low-cost chicken coop suitable for the desert climate. 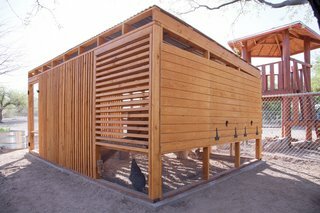 Tucson, Arizona–based architect Gideon Danilowitz took the required 40 hours of volunteering at his son’s school very seriously—so seriously, in fact, that he designed and helped build a new chicken coop for the school. 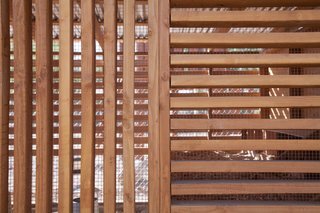 He sought to provide plenty of shade for the birds while allowing breezes to enter and further cool the space. To do so, Danilowitz developed a series of studies that looked at the sun angles throughout the day and year in the desert climate of Tucson. 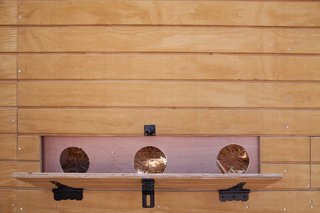 Based on these studies, he oriented the wood two-by-fours horizontally or vertically so that they would block strong summer sun and midday sun, but allow in warming winter sun. Danilowitz completed a series of sunlight studies to understand how sunlight would move through the space over the course of days and seasons. It was important that the project be completed with a low budget using simple materials that could be easily obtained from a local construction or hardware store. 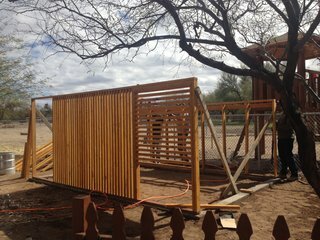 All together, the structure cost less than $1,500 in materials, with standard dimensional lumber taking up more than a third of the cost; labor was free thanks to volunteer work from other parents at the Tucson Waldorf School. The chicken coop under construction. 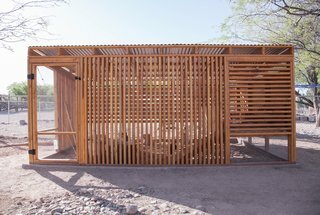 The simple materials and thoughtful design of the 160-square-foot structure, combined with the efforts of the local parents, resulted in a sophisticated structure that takes advantage of what the desert has to offer. 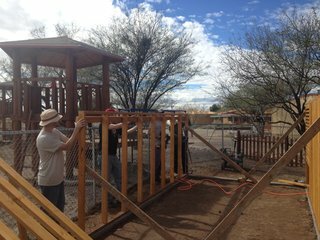 The coop was designed by architect Gideon Danilowitz and was constructed with the help of fellow volunteers from his son's school in Tucson. 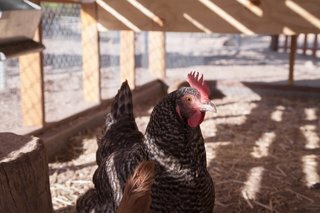 Careful studies of the sun led to the distinct designs of each side of the chicken coop. 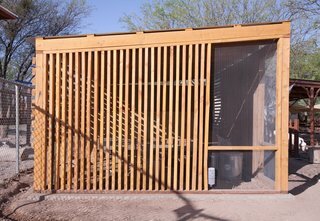 Each facade of the coop is distinct based on orientation to the sun. The walls are made largely of dimensional lumber in standard sizes as well as wire mesh. Some lumber was pressure treated to avoid rot and termite damage. 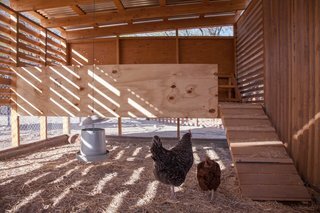 On some sides, the chicken coop features wood siding rather than louvered wood because of the orientation to the sun. Water and food feeders were salvaged from the old chicken coop. 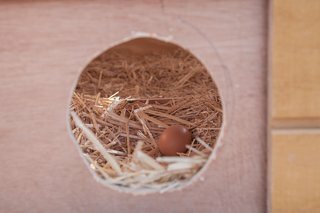 Boxes where the chickens can nest and lay eggs are located on one side of the coop. Hinges, plywood, and wood siding were also included in the budget. 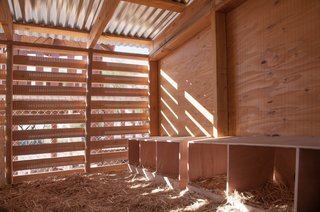 The orientation of the coop and its carefully placed dimensional lumber allow the interior to have dappled light. The new coop was a collaboration between parents who volunteered on the project. 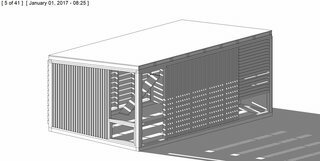 Standard dimensional lumber was used to create the louvered facade with lumber running both horizontally and vertically according to the desired lighting effect. Have your own Budget Breakdown to share? Find out how to submit your story to Dwell.